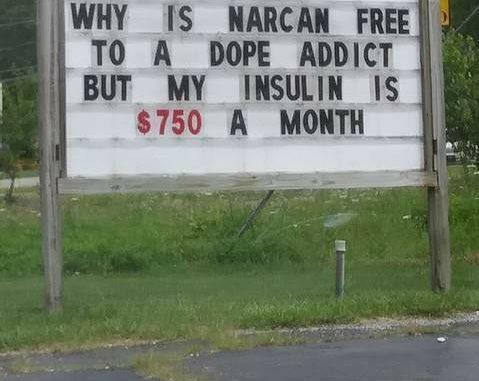 “Why is Narcan free to a dope addict but my insulin is $750 a month?” asks an online meme that has since gone viral. 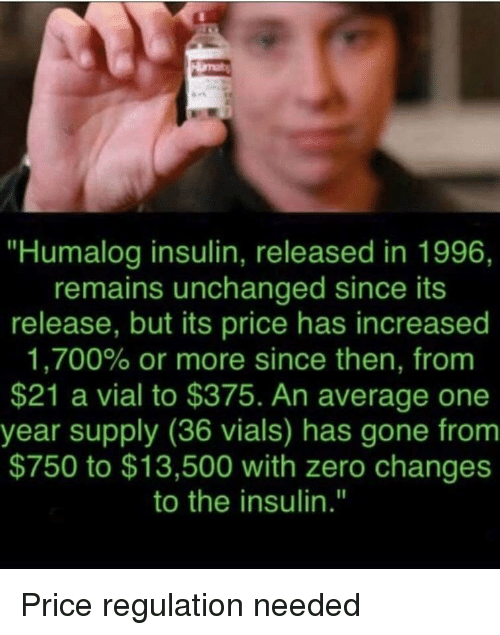 “Humalog cost $21 a vial in 1996 and now that same insulin is $375” claims another meme designed to call for price regulations. While these statements do have some truth behind them, on the whole, they are bumper sticker slogans designed to elicit emotional responses rather than encourage the reader to critically examine what could be the reasons for the price increases. While insulin is manufactured by large drug companies, it is very different from other medicines that now have cheaper generic forms because it is classified as a biological product instead of a chemical one. There are many reasons and theories on why the costs have continued to rise much faster than inflation has in the past twenty years. Corporate greed, government over-regulation, constant technological advances that greatly improve the product while also requiring huge research & development budgets, and a market system full of middlemen between the consumer and producer are all possible reasons for the list price of insulin tripling between 2002 and 2014. Insulin is a hormone produced by the body’s pancreas to breakdown sugars in the bloodstream. When the pancreas stops producing insulin, the body’s blood sugar levels rise to often dangerous, life-threatening levels. As of 2015, there are 21 million Americans (roughly one in 15) diagnosed with diabetes, and 26 percent of them take insulin to survive. One hundred years ago, diabetes was much rarer to find in the population, and for those who had it, it was often fatal. In essence, it was a death sentence. Canadian researchers Frederick Banting and Charles Best created a process in 1922 that removed and purified insulin from cows and pigs for use in humans. Early trials of the first insulin were a success. Knowing they didn’t have the means to mass produce insulin for public use, they sold the patent (which included the patent rights on any insulin manufacturing improvements) for $3. For over 50 years, animal-derived insulin was the only kind available for use. But in the late 1970s, there was a major breakthrough. Using recombinant DNA technology, drug companies were able to take bacteria and then sequence the DNA to synthesize insulin that’s very close to the type created by the human body. Humulin, the first of this kind of insulin, hit the market in 1982. It is important for diabetic patients to maintain a constant blood sugar level throughout the day, or life-threatening problems can quickly develop. The perfect amount of insulin injected into the body at the right intervals is needed to maintain this balance. In the 30 years since the first synthetic insulin was introduced to the market, drug companies have made vast improvements in the quality and range of insulin they provide. Patients are now able to take as little as two injections a day, instead of multiple times, while closely monitoring their diets. Innovation costs a lot of money on the research and development end because it is expensive to develop and test new drugs. This constant improvement has also kept the patents for insulin in the hands of three big companies—Sanofi, Novo Nordisk, and Eli Lilly—because the original 1922 insulin patent included patent rights on any manufacturing improvements. However, some of the patents these companies hold started to expire in 2014, allowing other companies to produce the drug without the R&D overhead. To date, a fourth drug company has not stepped up to the plate. Manufacturing insulin is different from other drug manufacturing because you are biologically replicating a human hormone rather than creating a chemical medicine that interacts with the body. The costs of purchasing the equipment necessary to enter this market are prohibitively expensive. Plus, there is no guarantee that fourth-party insulin will make it to market because it is classified by the FDA as a biosimilar, and it’s subject to stricter regulations than other medicines. Technically, there will never be generic insulin because it’s biologically based rather than chemical. Instead, there are bio-similars, which are products that are equivalent in function but they’re not 100 percent identical to the insulin they are replicating because the biological matter is very complex. Copying an existing chemical drug is straightforward. But for bio-similars, it is very difficult to point to a “generic” copy on insulin and prove that it is the same. Even though the most recent insulin patents have been expiring since 2014, it is not easy for a fourth party to enter the market as their “copy” of the existing insulin would still be subject to a strict FDA review process to prove that their dosages would have the same effect on users that they receive from the existing insulin. The FDA is already under heavy criticism for slowing down the pipeline of any new drugs entering the US market while also raising costs on manufacturers because of their intensive approval process. Because FDA testing and approval create a huge barrier for new pharmaceutical products entering the market, the costs for entry into the business of insulin manufacturing are much higher than they would be without the strict processes of this department. While there hasn’t been the rise of a fourth insulin manufacturer since 2014 when patents began to expire, two bio-similar insulins have entered the market. Eli Lilly introduced Basaglar in 2017, which is similar to Sanofi’s Lantus brand insulin and listed for 15 percent less. Soon after that, Sanofi introduced Admelog, which is similar to Eli Lily’s Humalog and also listed for 15 percent less. Consumer advocates have suspected for years that to increase their profits, the three companies have been working together rather than competing with each other. In 2002, when insulin list prices skyrocketed, each company was noted as raising their prices in lockstep with the others. In December of 2016, attorney generals from 20 states accused the three companies of colluding as a trust to have a monopoly on the market. In response to public backlash, Novo Nordisk has pledged not to raise the prices more than 10 percent annually, while Eli Lilly offered a 40 percent rebate to customers buying their insulin at full price. They also suggested that another industry carried the blame for the huge price list increases. As public anger builds against the drug manufacturers, another player in the larger health market is beginning to be examined. Pharmacy Benefit Managers (PBMs) are the brokers of deals between drug companies and their largest customers, health insurance companies. The PBMs make a commission off of how much a discount they can get for the insurance companies from the manufacturer. It’s in their interests to negotiate from the offered price to the lowest price. Because these brokers act as gatekeepers to the largest share of the market, drug manufacturers have been suspected of artificially inflating their list prices so the PBMs get a higher fee and have a financial interest to do business with the company that lists their stuff as expensive but offers a steep discount. The position of the three big companies is that they don’t collude with each other, and the list price is essentially an imaginary price that no one should actually be paying. Until recently, for many people without health insurance, that price was a reality. While list prices have not decreased, Eli Lily has partnered with Express Scripts Holdings in 2016 to give 40 percent rebates to customers who are paying for their insulin at the full retail price. In March of 2019, Eli Lilly also announced they would offer an “authorized generic” version of Humalog for $137.35 a vial, which is 50 percent lower than Humalog’s list price. An authorized generic means that everything is the same about the drug except for the name on the label. While this still doesn’t lower prices to 2002 levels, competition will hopefully be fostered among the three companies to lower prices and capture the uninsured customer. In a free market, competition is the best way for improvements in the levels of quality and service that a consumer receives in their products. The FDA needs to reform and relax the standards needed for other, smaller companies to enter the market. Even having the option of buying the less effective but also dramatically less costly animal-based versions of insulin would be an improvement in the lives of those living with diabetes and without health insurance. Because there are thousands of diabetics in the United States who don’t have medical insurance, it is positive to see the drug companies work with pharmacies to lower costs to directly sell to the consumers. Diabetes is a life-long condition where the circumstances do not often change after the initial diagnosis so a more efficient pipeline from insulin producers to insulin users should help lower costs in the long run. Likewise, as the patents have begun to expire, we see a sign that synthetic insulin has reached its peak of perfection for users. As research and development costs decline for the companies, so should the cost of the product. Another way to help lower costs could be to change laws so Americans can buy drugs directly from Canadian companies and import them across the border. Animal-based insulins have disappeared in the United States, but they are still on the market in Canada and are cheaper than their synthetic counterparts. Having a drug that isn’t as effective as another one but still works is better than not having anything at all. We also need to recognize that a diabetes epidemic has erupted in modern times, fueled by poor diet and lack of exercise. Type 2 diabetes and obesity are directly related to each other. The best way to lower the costs of insulin is to decrease its demand by making lifestyle choices that embrace healthy eating and exercise. The health market is a complex industry with many sub-industries that have overlapping interests. It’s difficult to navigate and understand, but at the end of the day, as participants of it, the best thing we can do in our own interests is to take care of ourselves.